What drew me to Pictura Cats was my seemingly fruitless search for well drawn cats to colour. Single-sided images - yes, but information on the reverse. Water based pens - yes. 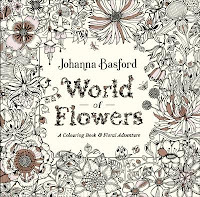 Who will love it - those who enjoy cats and all their foibles, those who like colouring gardenscapes, those who are already fans of Pictura. Comment: The Pictura range is something special. Initially just friezes, you can now get poster books too. They have used top illustrators like John Howe (Draconis), Niroot Puttapipat (Fairies), Aleksei Bitskoff (Monster Party)and David McKee (The Fair Comes to Town). 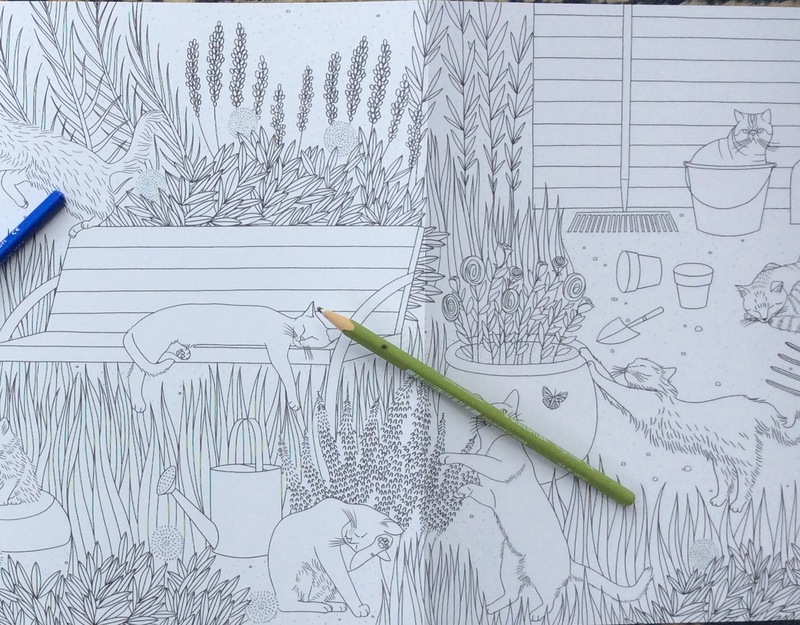 Pictura Cats is a folding frieze of eight panels that takes you through a cat filled garden. 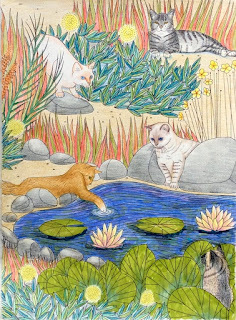 Here they doing what they do - fishing in the pond, watching each other cautiously, getting ready to pounce, stretching, sitting in things, sleeping of course, and lounging on a garden seat. What's more, there are lots of different breeds here too. 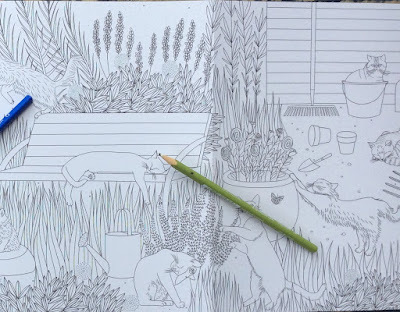 A cat and garden paradise that I find is compelling to colour. And there are kittens too! Drawing: At last, here is someone who can draw cats and understands them. Thanks Laurie! The garden is really interesting too. There are lots of different textures through leaves, rocks, water, garden implements, some flowers and differing ground. 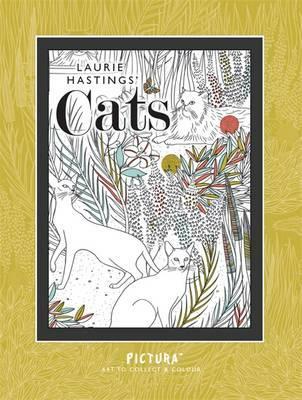 All is done in medium to fine line work with some shading on the cats to help you out with their markings and shape. Paper and Layout: As this isn't a book, the same issues don't apply. 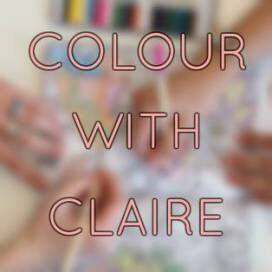 You can choose to colour the whole eight panels or detach each one and frame it when coloured. For my colouring above, I copied that page to colour for this review. I intend to colour the entire background of the frieze first, when I have time. 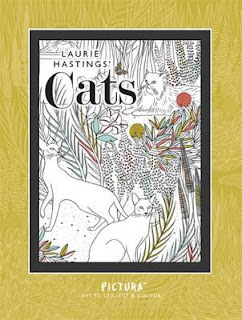 On the inside cover is a brief Q&A with artist, Laurie Hastings. The images are on sturdy, white card stock, firm enough for the frieze to stand up. On the reverse of the frieze is a key showing you the different cat breeds and some information about them. 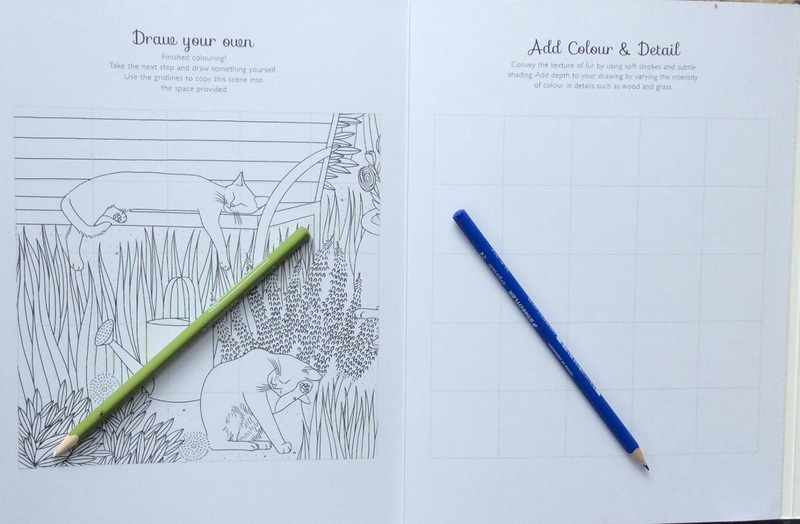 There are also colouring tips, suggestions for adding details, and a grid to encourage you to do your own drawing. 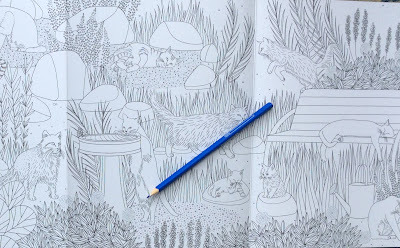 As the frieze is single-sided, you should be able to use whatever pens and pencils you wish to use but watercolours with caution. Where's Wally? A Riot of Colouring! Imagimorphia - the Amazing Kerby! 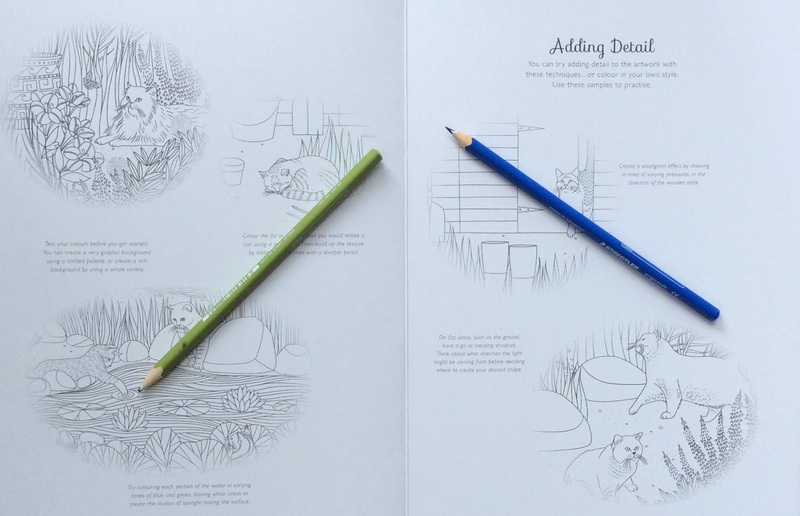 Colouring a Beatrix Potter Classic Tale. Po drugiej stronie snu - "that Polish book"